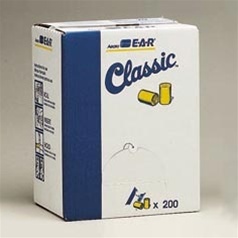 E•A•R Classic Soft earplugs are made of a patented thermal-reactive foam used by the NASA space program. The material feels smoother than ordinary foam, and starts out firm to allow for easy insertion. Then, the plugs warm with the body temperature. They actually soften and shape to the ear canal. This “custom,” low pressure seal helps provide an excellent NRR of 29 dB. Better yet, the plugs get even softer and more comfortable with extended wear. These plugs are a favorite with our film industry customers, due to their neutral "flesh" coloring. We also get a lot of music industry orders for these due to the fact that they are more inconspicuous that other plugs. But don't let their crossover appeal fool you, with a Noise Reduction Rating (NRR) of 29 these are a great match for a day at the range.